Meditation does not have to involve chanting, however some forms of meditation do and mala beads are the helpful accessory to aid you in your practice. Over the last few years they have become somewhat of a fashion accessory and although they make great bracelets and necklaces, they actually have a very practical use. A mala is a string of 108 beads with a focus bead (Guru bead) at the head or the bottom of the string. Firstly they are a tool used to help you keep track of your mantras during meditation. Secondly, they are a wonderful way to wear your intention all day long as a constant reminder of the thing you are working towards. The numbers 9 & 12 are considered by many to be very sacred numbers and 9 x 12 = 108. 100 mantra recitations are counted as completed, while the remaining 8 are there to give room for mistakes made whilst chanting. The 8 are also said to be an offering to God or your Guru. The numbers 1, 0, and 8 also have their own specific meanings. 1 for God/ Higher Truth, 0 for emptiness/ completeness in spiritual practice, and 8 for infinity/eternity. Great for people who have trouble sitting quietly without their brain wandering, Japa ( mantra ) meditation involves the recitation of a mantra. The mantra can be recited softly out loud, or quietly in your own mind. It is a great technique for bringing your mind to focus on a single point of concentration. By repeating your mantra over and over, you bring focus to your intention, and are better able to absorb it’s meaning. It’s important to choose a mantra that has a meaning for you, be it an old traditional mantra ( usually in Sanskrit ) like Om Mani Padme Hum or a more modern mantra or affirmation such as Every day in every way, I’m getting better and better. It helps you to set an intention or focus on something that you want to achieve and to put positive energy into it with your intention. 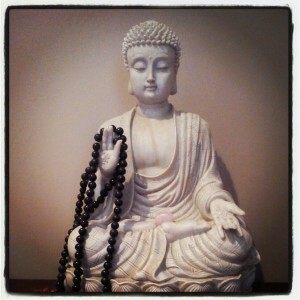 Whichever mala that you are initially drawn to is usually the one that is meant for you. To further focus your intention, you can choose a mala that represents certain things. Rudraksha seeds are often used in malas, and they help to calm the mind, body and spirit. and different gemstones have different meanings too. I personally have 3 malas, all different and I use them for different meditations. Whatever you choose will be right for you. 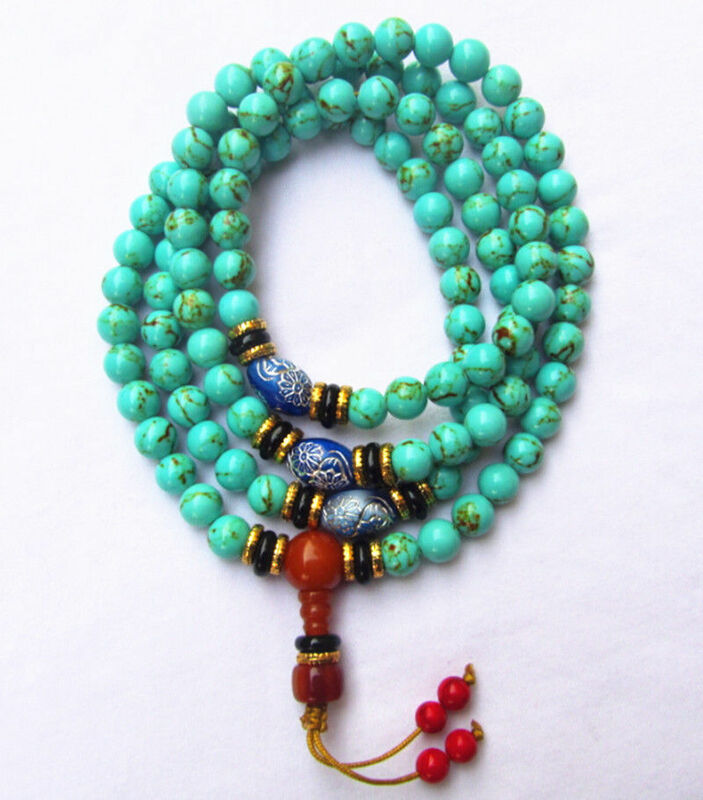 When you have your mala, you will notice that there is a 109th bead at the end, commonly known as a Guru bead. This bead is not counted during your recitations, and should never be touched during meditation. The Guru bead is said to harness all of the energy of your practice. Start at the bead next to it (either side is fine) and begin your mantra. For every mantra repetition, you should hold the bead between your thumb and middle finger, gently spinning the bead as you recite your mantra. Then simply move on to the next bead. Work your way around your mala in this fashion until you reach the Guru bead. You will have now recited your mantra 108 times. If you wish to continue, simply turn back in the opposite direction and repeat the process. The Guru bead is really useful for reminding you that you have reached the end of 108 recitations. You will find that some malas come with spacer beads (usually after every 27th bead). These spacer beads are meant as an easy way to mark your place and re-focus your mind if it starts to wander. Usually, these spacer beads are not counted as a mantra bead. 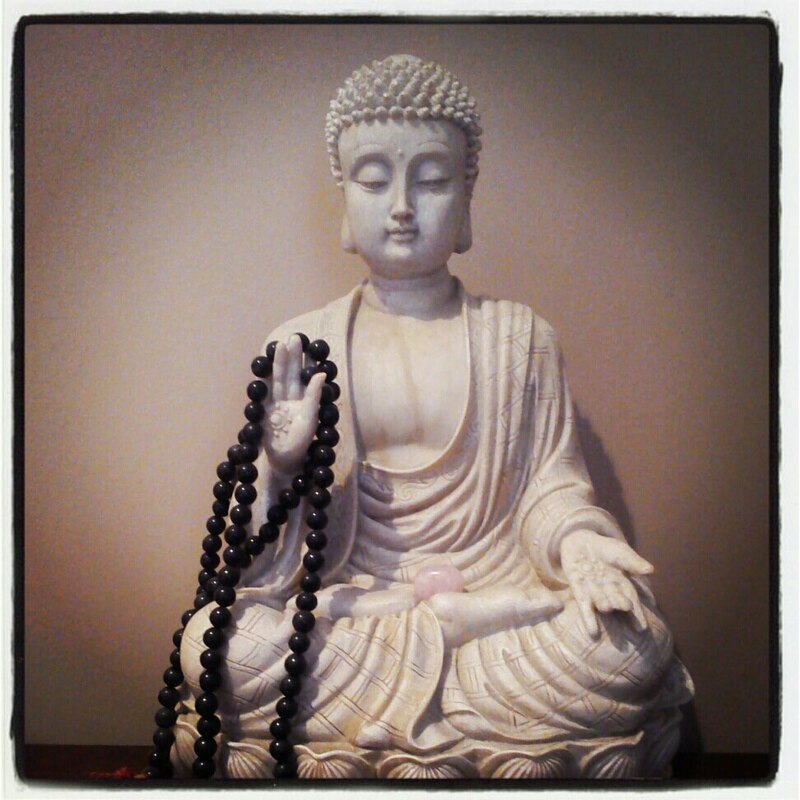 Before you begin, count the beads on your mala to see whether your spacer/reminder beads are meant to be included. Personally I prefer plain beads without spacers but it is a personal choice. If you can have your mala blessed by a Lama then it’s a wonderful thing, if not then you can simply charge them with your intention and smudge them with incense smoke. If your mala should break than traditionally it is viewed as a positive occurance. It symbolizes a breakthrough in your practice, a sign of progression. If your mala breaks, think of what breakthroughs you have experienced. This may be a sign that the intention you have been focusing on has come to fruition and it’s time to set a new one. will gladly re-string it if you ask them to. So now all you have to do is find the time to meditate and choose a mantra that suits you. Good Luck and enjoy.